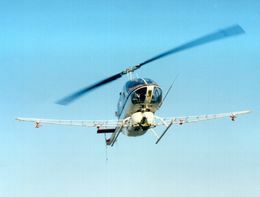 The AU4000 is a precision engineered rotary atomiser designed specifically for use on agricultural aircraft for specialised ultra low volume (ULV) spraying operations. The large diameter gauze assembly and durable bearings are designed for continuous operation at the high rotational speeds required to produce the small droplets necessary for environmental health, migrant pest, forestry and similar ULV spray applications. 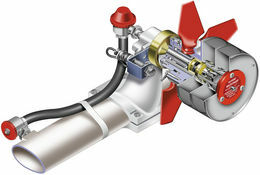 The atomiser is driven by the airflow past the aircraft through five highly efficient fan blades. These are adjustable in pitch, enabling the rotational speed to be varied to produce the required droplet size. The atomiser is fitted with an electro-magnetic brake to prevent rotation when flying outside the spray area. This minimises the drag of the atomiser during long ferry flights and maximises bearing life. AU4000 atomisers are suitable for installation on a wide range of aircraft types, including modified fast utility aircraft. 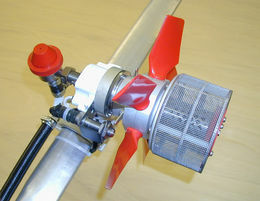 Different lengths of fan blades enable the atomiser to be used on aircraft operating at speeds between 80 - 240 km/hr (75 - 150 MPH). Applications such as environmental health spraying (fly and mosquito control), spraying of migrant pests (locust, armyworm etc.) 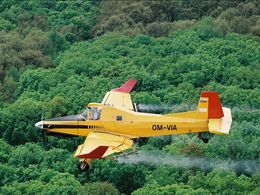 and forest pest control require the production of a narrow controlled spectrum of small spray droplet sizes. The AU4000 atomiser uses a large diameter rotating woven wire cylinder to produce the spray droplets. The large surface area of the gauze allows the atomiser to handle a wide range of flow rates and is not liable to blockage, even with viscous liquids or formulations with a high solids content (such as some biological insecticides). The flow to each atomiser is controlled by a variable restrictor unit (VRU). This provides finger-tip control of the flow by a simple turn of the knob and eliminates the need to dismantle or change individual restrictor orifices. 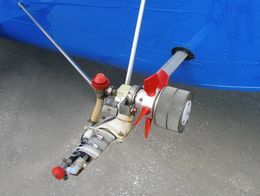 Overall flow from the aircraft is regulated by boom pressure in exactly the same way as a conventional spray system, with chemical feed to the atomiser from a 3/4" (19 mm) id hose or 7/8" UNF fitting. Every atomiser is supplied with a diaphragm check valve and a secondary shut-off valve inside the unit. These ensure immediate and precise liquid shut-off at the end of each spray run and eliminate the risk of chemical leakage on the ground. 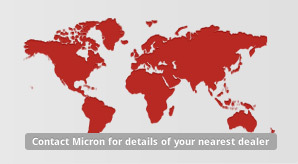 The optional Micronair application monitor gives the pilot an accurate display of application rate, volume sprayed, area treated and other information. The application monitor can also be connected to RPM (tachometer) transducers mounted on each atomiser. This enables the rotational speed of all atomisers to be measured to ensure that they are producing the required droplet sizes. Every atomiser is supplied with a diaphragm check valve and a secondary shut-off inside the atomiser. This unique combination ensures an immediate and precise shut-off at the end of each spray run and eliminates the risk of chemical leakage on the ground. 2.8 kg (6.4 lb) without mounting clamp or block. By mounting clamp or block types available to suit Micronair installation kits and popular boom sections. By variable restrictor unit (VRU). By diaphragm check valve and internal secondary shut-off. Note: Above figures are for guidance only. Performance will vary according to chemical formulation and conditions of use. See AU4000 Handbook for full details.